EVEN the great Samboy Lim could have not been proud with the way Barangay Ginebra played on Sunday. The Kings started out flat and ended the same way against Globalport in a 98-77 rout that stretched their losing run to three in the PBA Philippine Cup. The pro-Ginebra crowd at the Smart-Araneta Coliseum went eerily silent the moment the Kings found themselves trailing the Batang Pier after the first quarter as Romeo, Ronjay Buenafe, and Alex Cabagnot combined for 17 of the team’s 24 points. The lead ballooned to as much as 24 (57-33) and the closest the Kings could get was at 91-77 in the final two minutes. Ginebra had earlier dedicated the game to Lim, their former team manager, who went into coma after collapsing in an exhibition game Friday night at the Ynares Sports Center in Pasig. But it didn’t turn out the way the Kings wanted to be as they fell to a 5-4 record with their third straight loss. The win on the other hand, gave interim Eric Gonzales a fitting coaching debut in the PBA after taking over the reins from Pido Jarencio. The Batang Pier evened their record at 5-5 and continue to push for a berth in the playoffs. “Am very grateful to God, the management, and coach Pido,” said Gonzales, a one-time track and field player from University of Santo Tomas, who was only notified of the coaching change through a text message coming from team owner Mikee Romero. “Right now, interim lang po ako. I just follow what management tells me,” added the soft-spoken mentor, who also serves as assistant to Nash Racela at Far Eastern University. Romeo topscored for Globalport with 25 points, 13 coming in the first half alone including a three-pointer to end the second period that gave Globalport a 52-31 lead. By halftime, Globalport’s bench already outscored its Ginebra counterpart, 34-10. It ended with the Batang Pier holding a 67-33 edge in points off bench. Greg Slaughter carried the fight for Ginebra with a double-double of 21 points and 15 rebounds. 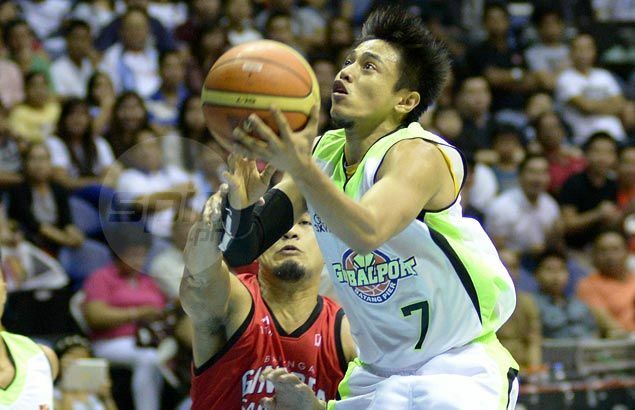 GLOBALPORT (98) - Romeo 25, Semerad 17, Cabagnot 15, Jensen 11, Pinto 5, Buenafe 5, De Ocampo 5, Baclao 4, Caperal 3, Ponferada 3, Pringle 2, Nabong 2, Isip 1, Taha 0. GINEBRA (77) - Slaughter 21, Aguilar 14, Tenorio 11, Baracael 10, Yeo 6, Ellis 4, Caguioa 4, Mamaril 3, Helterbrand 2, Brondial 2, Monfort 0, Forrester 0, Urbiztondo 0, Reyes 0. Quarterscores: 24-16; 52-31; 75-57; 98-77.